Initially, R wasn’t sure what to do with the I Spy bag. She shook the bag and tried to pull it a part to get at the objects hidden inside. I showed her how to shake the bag and reveal different objects. Together, we spotted and pointed to the stars, the moon, an astronaut and a rocket. 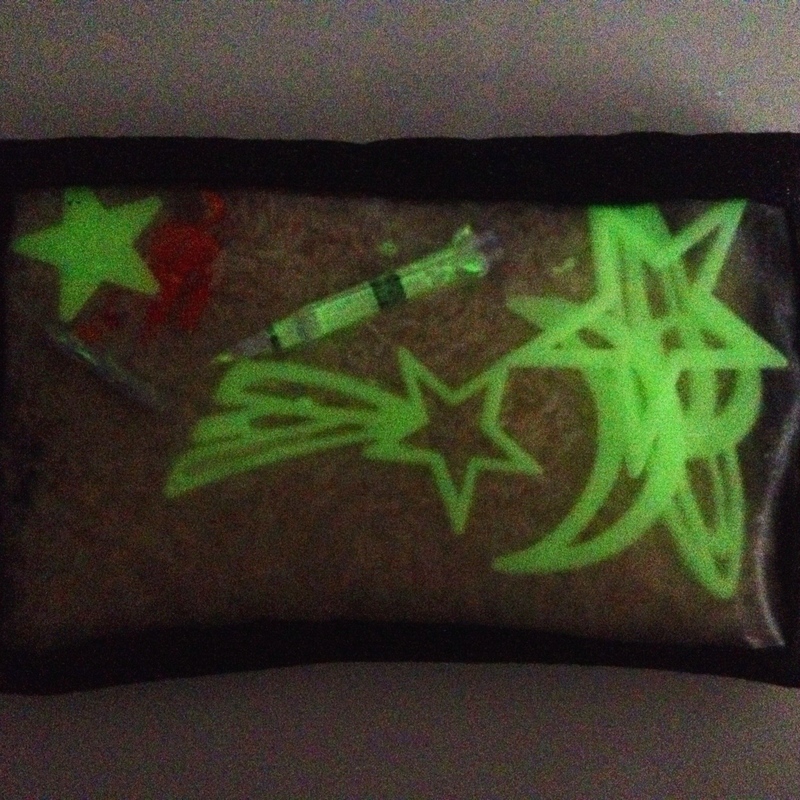 R especially loved the bag when I showed her that it glowed in the dark. Her reaction upon seeing the objects glow was, “wow’! I made the I spy bag using felt and contact paper. I used one rectangular piece of felt and cut a viewing window out of the bottom half of the felt. I covered the cut out portion of the felt with contact paper so that the window was see through, yet flexible enough to allow the objects to move around inside. Since I don’t have a sewing machine, I used liquid stitch glue to seal up all the edges and let the bag dry over night with a heavy book on top to keep the seal tight. 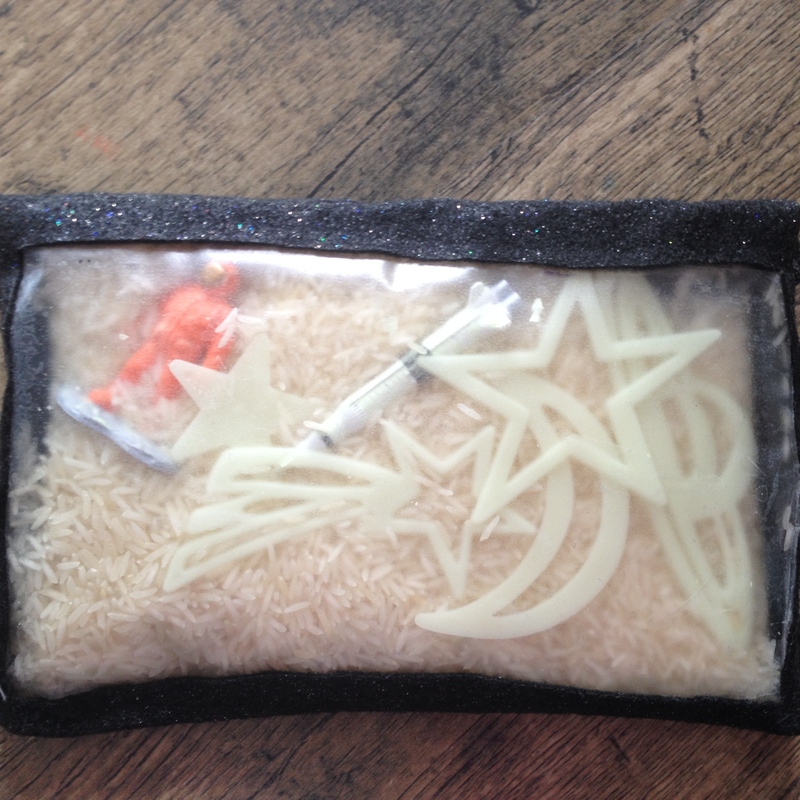 I added rice as filler and glow in the dark space themed items inside for R to find. a. Reading Practice. Provide a list of all the objects in the bag. Have the child read each item one at a time and search for it. Once found, have the child put a check mark next to the found item. b. Writing Practice. Provide a blank list for the child. Have him/her write the names of the objects that were found. 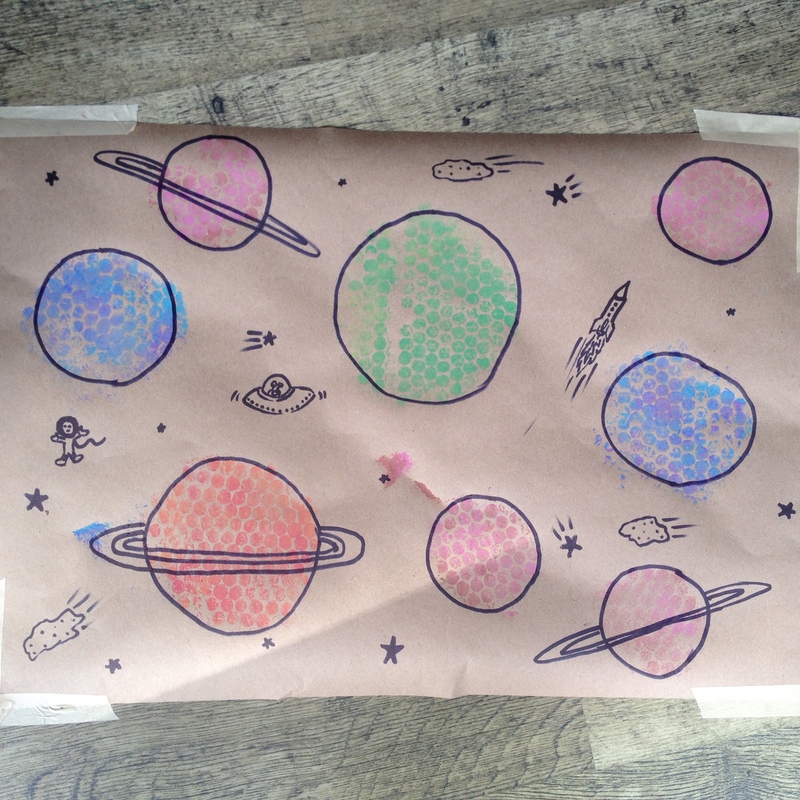 R, her dada and I made a space scene together. I cut out a variety of different sized circles from bubble wrap, taped them to a clipboard and had R paint them using a paint roller and a mix of colours. Once painted, I pressed one painted circle down at a time onto a large sheet of kraft paper. 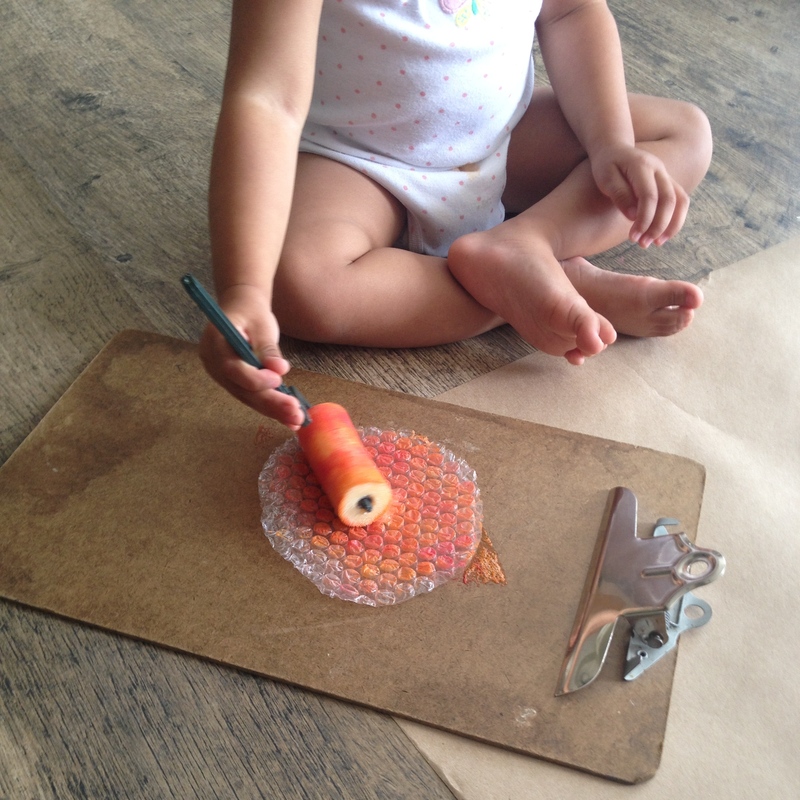 While the page was drying, we gave R a blank sheet of scrap paper to roll the paint on as she pleased. My husband and I embellished the scene using black marker. This activity is great for developing coordination as the paint roller has to be in the correct orientation in order to transfer the paint. a. Allow the child to embellish the scene using a black marker. b. For some writing practice, provide the child with a writing tool and allow him/her to label the different items in the space scene. Encourage beginning writers to sound out the words and write as many letters as s/he hears in each word. For example, the word “moon” may be written as “m” or “mn” or a completely unrelated letter, depending on the child’s writing level. Any writing the child can do should be accepted. Chelsea is a homeschooling, stay-at-home mom who loves to do daily activities with her daughter, Kesi. 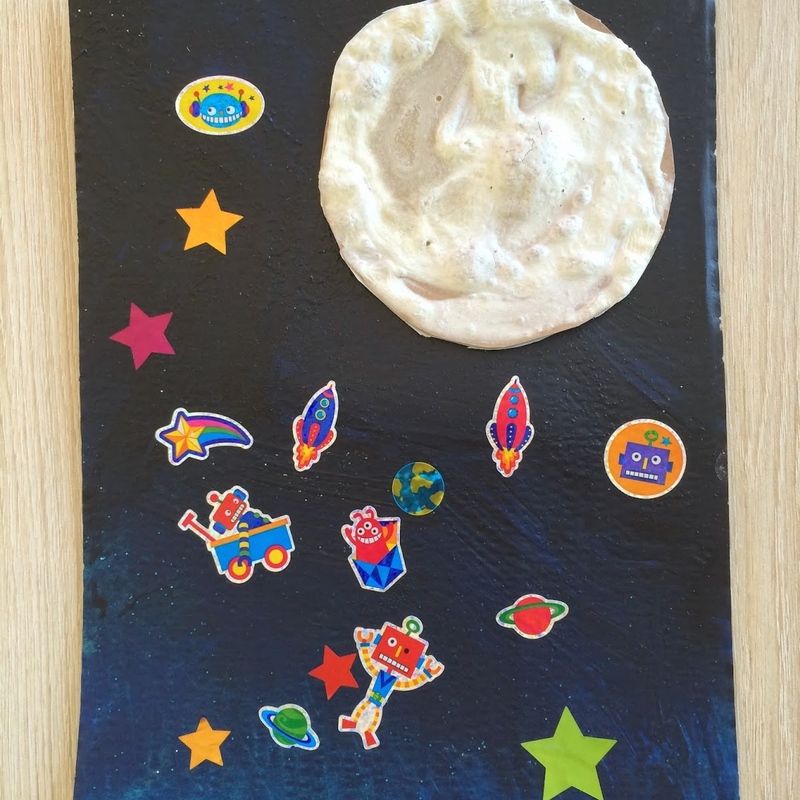 I loved this puffy moon painting activity she did with her daughter and thought it would be perfect for our space themed features. You can see Chelsea’s original post here. 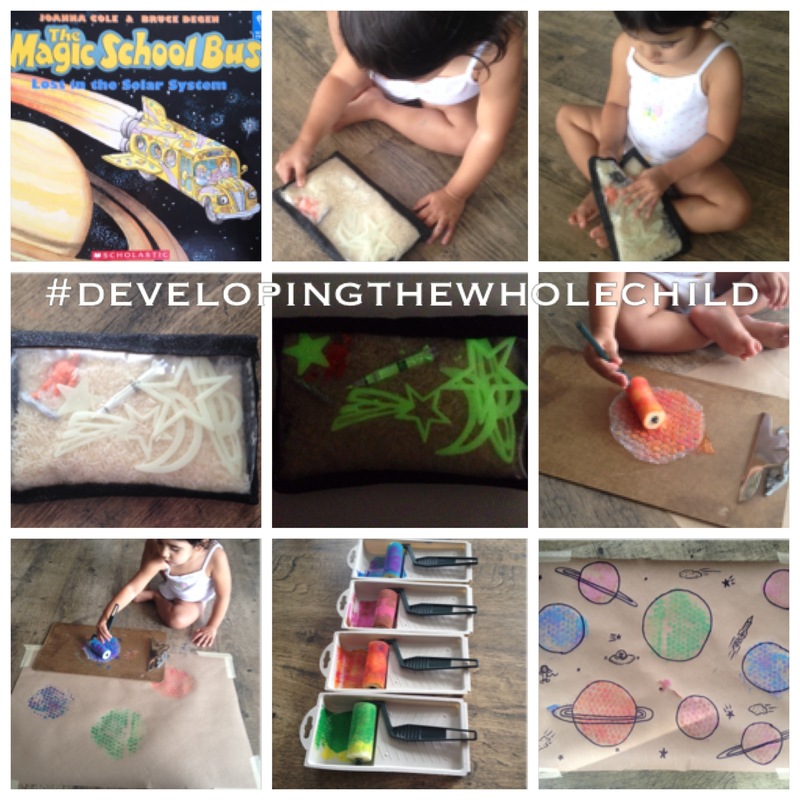 For this activity, Kesi spread the puffy moon paint onto cardboard circles. Once painted, the moon was put into the microwave for 30 seconds to give it a puffy texture. This is just enough for a small amount of painting. a. Create a Space Scene. Chelsea had Kesi paint a night sky onto cardboard using the technique we used for our bursting sunshine activity (see here). Kesi then decorated the night sky scene with stickers and the puffy moon! What a fun way to incorporate the puffy moon!